Starting in March each year, the more than 430 golf clubs affiliated to The Golfing Union of Ireland begin their preparations to try and win one or more of the five main events – the Senior Cup, Barton Shield, Junior Cup, Jimmy Bruen Shield and the Pierce Purcell Shield. The agony….It is estimated that over 20,000 golfers and 1,500 club teams participate at the first stages of the events at Provincial level. The champions from each Province go forward to compete in the All-Ireland semi-finals and finals which this year will be held at magnificent Royal Tara Golf Cub in County Meath from September 18 – 21 with close to 500 golfers from 18 clubs involved this year. The action begins on Wednesday and concludes on Saturday with the Senior Cup and Jimmy Bruen Shield finals at a venue where Padraig Harrington won his first ‘major’ - the 1988 Leinster Boys’ Championship. Situated just beneath the storied Hill of Tara, what better place to crown the High Kings of Irish golf. The four provinces hold qualifying events in each of the five Cups and Shields with the provincial winners reaching the National Semi-Finals and Finals stage. The blue riband is the Irish Senior Cup, which was instituted in 1900 when Dublin University won it for the first time. Five players take each other on in singles match play, off scratch, and this year a new name could be added to the trophy with Rosapenna and Carton House meeting for the chance to take on the winner of match between the traditional powerhouses of County Sligo and Cork. Both County Sligo and Cork are also through to the last four of the Barton Shield which features two foursomes pairings playing off scratch in a competition commemorating the former GUI President, the Hon. Mr. Justice Barton. This year, Clandeboye and Rosslare stand in their way. Named after Professor Purcell, one of Ireland’s outstanding golf administrators, the Pierce Purcell Shield was won first by Massereene, in 1970. Five foursome pairings represent each club, comprised of minimum individual handicaps of 12 with the minimum combined handicap of each pairing amounting to now more than 27. It is one of the most sought after titles in Irish golf, an honour the average golfer can aspire to and one which this year will fall to Rossmore, Spanish Point, Corrstown or Claremorris. One of Ireland’s amateur golfing legends is commemorated by the Jimmy Bruen Shield, inaugurated in 1978 when Stackstown won the first competition. Clubs are represented by five pairings, the minimum individual handicap being six and the minimum combined 17. Leinster champions Castlecomer will meet the kingpins of Co Kerry, Killorglin while in other semi-final, Connacht champion Athlone face the Ulstermen of Tandragee. (08:30) Rosapenna v Carton House, (09:20) Co Sligo v Cork. Senior Cup Final, Saturday 21 September - (09:00). 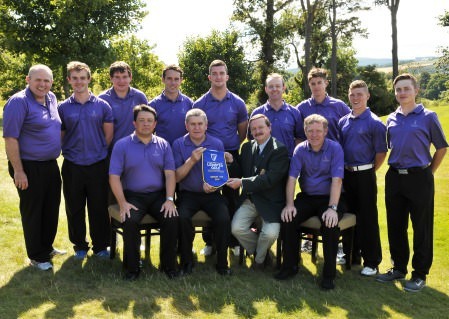 Leinster champions Carton House are hoping to create history at Royal Tara. Cork are keen to celebrate the 125th anniversary of the club’s founding with a sixth Senior Cup win and their first since 1998. But the Minster champions face a tough All-Ireland semi-final clash with three-time winner County Sligo, who were last crowned champions in 2007. Both clubs will be going for the Senior Cup-Barton Shield double but Cork captain Vincent Twohig has a strong side, headed by Munster Interprovincial stalwart Gary O’Flaherty, Mark Ford, John Hickey, Ian O’Flynn and Eoghan Murphy. “I was at the finals back in 1998 when we beat Shandon Park in Athlone and previous to that I’d been with the team at Portrush,” says 38-year old O’Flaherty, one of the most experienced Senior Cup players in the country. “County Sligo are always strong and nearly always come out of Connacht so we are expecting a very tough match. It’s hard to pick a winner because everyone is so strong. County Sligo’s Gary McDermott, a former international, expects a tough match with Cork but knows the Rosses Point men have a strong squad with Sean Flanagan, Steffan O’Hara, Declan Reidy, Shane Underwood, Mark Morrissey, Stephen Brady and David Brady. Whoever survives the clash of the giants between Cork and Co Sligo will be favourites against either Rosapenna or Carton House, who are the Cinderella stories of this year’s Senior Cup. Carton House have only been in existence for a decade, winning their first senior pennant by defeating Dun Laoghaire 3.5 - 1.5 to claim the Leinster title at Bray. The team of Marc Boucher, David Carey, Niall McGlynn, Sean O’Connor and Colin Cunningham is a strong one with Sean Walsh, Conor Glynn and Lee McMillan providing top class back up under captain Alan Egan. Carton House came through regional qualifying at Beech Park, defeating the Craddockstown, Beech Park and Hermitage on the way to the Leinster final where they beat Royal Dublin in the quarters and reigning All Ireland champions Castle in the semi-final. As for Donegal side Rosapenna, reaching the All Ireland semi-finals is a triumph in itself considering they have a panel of just five - playing captain Frank Casey Jnr, number one player Enda Kennedy, Donal Boyle, Patrick Kennedy and Martin McDermott. Beaten in last year’s Ulster semi-final by Warrenpoint, Rosapenna beat Mourne at Royal County Down in the semi-final this year with two matches being won on the first tie hole. In the final, they beat Fortwilliam by winning the first three matches to clinch the Ulster title for the first time and while they have never been to a Senior Cup semi-final, they have experience with Kennedy, McDermott and Casey all members of the winning All Ireland Mixed foursomes at Clontarf last year. Barton Shield Final, Thursday 19 September, (11:10-11:30). County Sligo’s Gary McDermott. Picture: Pat CashmanPortmarnock have dominated this event, winning the trophy 13 times with their most recent victory coming at Monkstown in 2008. However, their absence this year gives County Sligo a chance to close the gap and win for the fifth time. Winners in 2006, the men from Rosses Point claimed a hat-trick of victories from 1996 to 1998 and will be keen to stop Munster supremos Cork, who have been even more dominant with the most recent of their five wins coming at Westport in 1990. “It’s a tough competition and very hard to win because you are relying on all four guys playing well compared to three out of five in the Senior Cup,” says Cork’s Gary O’Flaherty. “It is a very difficult one to win and a competition we haven’t won since 1990, which is quite a while ago. “It’s great to be in both the Senior Cup and Barton Shield semi-finals with the club celebrating its 125th anniversary. It’s an added incentive. Cork qualified in South Munster, beating East Cork, Lee Valley, Muskerry and Mallow before going on to defeat Nenagh by two holes in the semi-finals and Waterford Castle by one hole in the Munster final at Mahoney’s Point, coming through on the 21st. 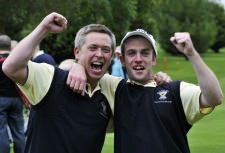 However, they face a tough semi-final match against Ulster champions Clandeboye, who thrashed Cairndhu by 10 holes in the semi-finals and then snuck past Warrenpoint on the first tie hole in the final at Shandon Park to keep alive their hopes of a first Barton Shield All Ireland pennant since 2002. Rosslare are very much the underdogs against the Sligo men. The Wexford club qualified behind Waterford at Mount Wolseley but then beat Courtown and Arklow, both by four holes, to progress to the Leinster finals at The Curragh where they edged past Dun Laoghaire in the quarters and defeated Castle Bearna by four holes in the semis before pipping UCD on the 19th to take the Provincial title. Managed by John McDonald the Rosslare team is a blend of youth and experience Mark Mullen, Philip Balfe, Tony O’Leary, Ian Lynch and Gary Collins, this year’s Leinster Youths champion. County Sligo last won the title at Enniscrone in 2006 and again cruised through Connacht with a two-hole win over Ballinrobe in the semi-finals and a whopping 11-hole triumph over Tuam at the Galway Bay Golf Resort with the pairings of Sean Flanagan and Stephen Brady, and Gary McDermott and Steffan O’Hara in top form. It could well be McDermott’s last appearance in the competition as the qualifying dates fall at a busy part of the season for a player who is still keen to win his first amateur major. Laytown and Bettystown’s Rory O’Gorman representing Milltown in last year’s All Ireland semi-finals. The second oldest inter club competition, the Junior Cup was first played for in 1900 and was won by Portmarnock. Since then over 60 different clubs have added this impressive piece of silverware to their trophy cabinet with some of the more frequent victors being Foxrock, Limerick and Lahinch. Ballybunion beat Ceann Sibeal, Tralee, Newcastle, Kenmare to emerge from West Munster and then saw off Muskerry in the Munster semi-finals and Tramore 3.5 to 1.5 in the final at Killarney Mahoney’s Point. They will take on Laytown and Bettystown, winners of the Junior Cup at Dundalk in 1997, in the semi-finals at Royal Tara with a very young team. The Co Meath club - home of Des Smyth and Declan Branigan - qualified from the Provincial Section in Leinster by beating arch-rivals Co Louth and Navan at Seapoint to advance to the Leinster finals where they edged out Naas and Balcarrick before beating Grange Castle 3.5-1.5 in the decider to advance to Royal Tara. Connacht champions Westport are favourites for the Junior Cup. Managed by Seamus Ward with the help of Tom Reid, Laytown and Bettystown has a great mix of youth and experience with the likes of Ward, Pat Rooney, Paul Hughes, Noel Dinsmore and Liam Hogan joined by 16 year old Eoghan Collins, 18 year old Conor Taylor, a son of former Irish great Carol Wickham, and Rory O’Gorman, the son of Carol’s sister Phil, another Irish women’s great. “Rory would have played for Milltown but he was doing his Leaving so we got him because he’s also a member at Laytown and Bettystown,” explains Rooney, who was involved with the teams that reached the finals of the All Ireland Senior Cup and Barton Shield in years past. “The team that neat Naas, Balcarrick and Grange Castle was the three young boys - Taylor, Collins and O’Gorman plus the manager Seamus Ward and Mark Gogarty. All Ireland winners at Lahinch in 1980, Westport will meet Ulster champions Slieve Russell in the second semi-final. The Westport line up of Ronan Heir, Tony Bree, Jack Healy, Ronan Mahon and Shane Larkin beat Castlebar 4-1 in the Connacht final. “The Junior Cup has been targeted for the last two years, ever since we knew we had the Connacht final at Westport,” said secretary manager Paul O’Neill. “There are three members of the panel that at survivors from the 2006 team that lost to the Island in the semi-finals at Enniscrone - Tony Bree, Ronan Mahon and the manager Shane Larkin, who is a player now. “We have a panel of seven and two of them have won All Ireland titles already this year, Jack Healy and Sam Gillivan were members of the Rice College team that won the All Ireland Colleges title at Balmoral this year. As for Slieve Russell, the men from the spectacular Co Cavan club beat Killymoon, City of Derry and Warrenpoint en route to the Ulster final where they came out on top against Roe Park, winning the title 3-2 at Balmoral. The squad of Steven Montieth, Bryan Cribbin, Liam McElgunn, Francis Coffey, Brendan McGowan and Darren Donohoe has proved to be a highly competitive one and while they are the outsiders with the bookies, they are more than capable of springing a surprise against favourites Westport. (12:00) Castlecomer v Killorglin, (12:50) Athlone v Tandragee. Jimmy Bruen Shield Final, Saturday 21 September (10:30). Munster champions Killorglin are fancied to reach the final of the Jimmy Bruen Shield.The 35th edition of the Jimmy Bruen Shield, which was inaugurated in 1978 when Stackstown won the first of their two titles, is one of the most fiercely contest trophies on the Irish amateur calendar. Nine clubs have managed to win it twice - Beech Park, Clonmel, Clontarf, Galway, Nenagh, Stackstown, The Island, Thurles and Warrenpoint - but there will be a new name on the trophy this year with Castlecomer, Killorglin, Athlone and Tandragee through to the All Ireland semi-finals at Royal Tara. Clubs are represented by five pairs, the minimum individual handicap being six and the minimum combined 17 and Athlone will be gunning to improve Connacht’s record in the event with Galway (twice) and Claremorris accounting for just three wins by the western province. Wins in East Connacht over Portumna and Roscommon and Tuam sent them through the provincial semi-finals where they beat Castlebar before going on to defeat Galway Bay in a nail-biting decider 3-2 . The pairings of Padraig O’Connor and John Costello, Conor Rice and Mark Kelly, Thomas Gilhooley and Michael Ryan and John Rice & Desmond Rushe were brilliantly assisted by Tony Corry and Gerry Kelly, who won on the last to secure their club’s trip to Royal Tara. They will face Ulster champions Tandragee, who lost to eventual runners-up and hosts Castlebar in the All-Ireland semi-finals in 2010. Still seeking their first green pennant, the Co Armagh club will be determined to go at least a step further this year. In Ulster they beat Holywood at Lisburn, Mannan Castle at Warrenpoint and Rockmount at Malone before going on to defeat Greenisland 3.5 - 1.5 in the Ulster final at Letterkenny. The winners of the clash between Athlone and Tandragee will take on Castlecomer or Killorglin in the final. The Kilkenny man are flying high following their win in the Leinster finals at the Curragh where they beat Citywest 3.5 - 1.5 in the semi-finals with Victor Smyth and Ken Hovendon, Tom Coogan and Paul Campion, John Doheny and Pat Comerford, David Breen and Damien Fogarty and Shay Kennedy and Micheal Coogan forming their line up. They went on to beat Hermitage 3-2 in a final with a performance that will give them confidence. Despite losing the first two matches and trailing in two more, they stormed back to win by the narrowest of margins with Kennedy applying the coup the grace to Hermitage by draining a 30-footer for birdie on the the 18th. Willie O’ Gorman, Adam Dempsey , Marty O’ Shea, Colum Lynch, Eddie Kenny, Nicky Walsh and Michael O’ Neill have also played their part in Castlecomer’s success. As for Munster champions Killorglin, their huge squad of Shane Collins, Dennis Bird, Paul McKenna, Eugene Kennedy, John McCarthy, Cormac Foley, Darragh Carmody, Mike Ashe, Dermot McKenna, Aidan Spillane, Jim McCarthy, Ger Joy, Jim Doona (Manager), Joe Kennedy (Captain), Maurice Foley (Manager), Robert Kennedy, Keith O’Sullivan and Gerry Fleming will be a force to be reckoned with. Founded in 1992, the Kerry club has already created history with victory in Munster where they saw off Ballyheigue Castle, Dooks, Castleisland, Tralee and Kanturk in West Munster before beating Cork in the semi-finals and Lissome in final to capture the provincial title and a trip to Royal Tara for a date with destiny. (11:40) Rossmore v Spanish Point, (12:30) Corrstown v Claremorris. Spanish Point are favourites for the Pierce Purcell Shield with the bookies. First won by Massereene in 1970, the Pierce Purcell Shield features five foursome pairings, comprised of minimum individual handicaps of 12 and a minimum combined of 27, leading to some of the most exciting and nerve-shredding matches you are every likely to see. Galway, Muskerry, St Annes and Warrenpoint have all won this shield more than once but a new name will go on the trophy this year with Corrstown, Claremorris, Rossmore and Spanish Point all vying for the trophy. County Monaghan club Rossmore won the Ulster title at Balmoral with victory over Armagh in the final, making amends for last year’s defeat in the decider. Captained by Eugene McGinnity, it was Rossmore’s first national pennant with Pauric Trappe and Brendan Casey, Michael McQuaid and Darren Connolly, John Heffernan and Alan Finnegan, Adrian Trappe and Dermot McMahon and John McKenna and Malachy Deery aided and abetted in their task by Gerry McMahon. They now face Spanish Point from County Clare, who made history by winning the Munster Pierce Purcell title for the first time in the club’s history. Having beaten East Cork 3.5 - 1.5 in the semi-finals, the side managed by Eoin O’Loughlin and Michael O’Connor went on to beat NewcastleWest 4-1 in the final with Brendan Coyne, Micheal Hehir, Kevin Hynes, Stephen Guilfoyle, Evan Talty, Fergal Hehir, John Meere, Conor O’Loughlin, Martin Glenny, Aidan Sexton, Martin Dormer, Seamus McMahon, Micheal Talty, Eric Murrihy, Brendan Sexton, Anthony Garrihy, Mervin Heir and Thomas Mernagh all playing their part in the campaign. Corrstown, which is situated near Dublin airport, came through the Metropolitan Section in Leinster, beating Hollystown in the semi-final and Westmanstown in the final. A provincial quarter-final win over Dundalk at Laytown and Bettystown sent them into the Leinster finals on home turf where they beat Tulfarris 4.5 - 0.5 before defeating Callan 3-2 to claim the provincial title. Managed by Tony Barrett with assistance from Eamon Hennessy, Corrstown will select the men to do battle from Joe O’Dwyer, Jim Cowley, Paul Casey, Garry Beagan, Damien Lenagh, Martin McIvor, Arthur Browne, Tom Monaghan, Charlie Cronin, Brendan Doyle, John Dowling, Gerry Burns and Jarlath Beagan. Captained by Ger Noone, Claremorris defeated Belmullet, Ballinrobe and Castlebar to advance to the provincial semi-finals where they beat Galway 3-2. In the Connacht final they beat Tubbercurry 3-2 with Fergal Corbett and Fergal Hughes, Declan Lambe and Rossa Higgins, John Concannon and John Haverty, Kevin McDonagh and David Rattigan and Malachy Monaghan and Pat Coyne all playing their part in taking the 95-year old club, which boasts a wonderful course, designed by Tom Craddock. No doubt the Pierce Purcell warriors would love to take the trophy from the Hill of Tara to Co Mayo for a view of the distant Partry Mountains.